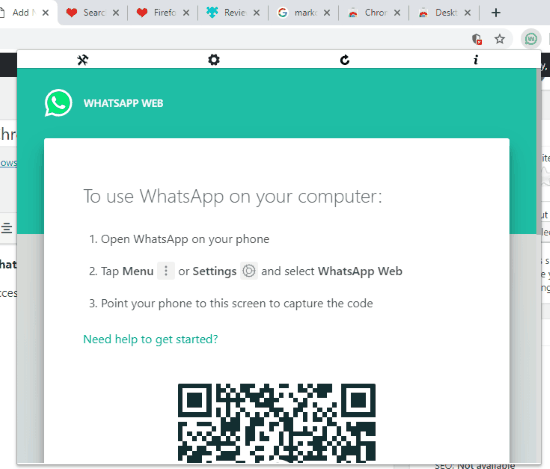 Here is a free Chrome extension to use WhatsApp in a pop-up without leaving the active tab. This extension is named “Desktop Messenger for WhatsApp“. Though WhatsApp Web is pretty good to access chats, start a new conversation, create a new group, mute, archive, pin, delete a chat, search for a chat, etc., the thing is we need to reserve a tab for it. And whenever we have to WhatsApp someone, we need to leave the active tab. This extension solves this problem. You can use WhatsApp web with just a click without navigating to any other tab and leaving the current tab. Apart from using WhatsApp Web in a pop-up, this Chrome extension also notifies you of new messages. You will see a blinking number on its badge icon which indicates the number of unread notifications. The extension also lets you adjust the size of that pop-up and color of blinking number. In the screenshot above, you can see WhatsApp is visible in a pop-up. 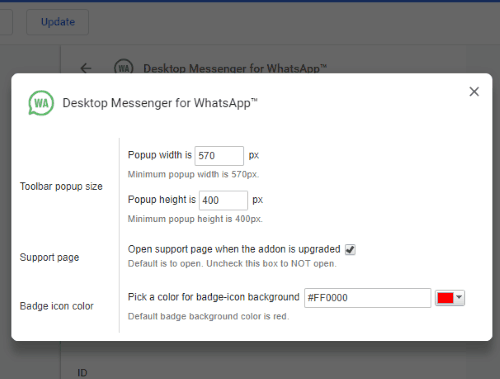 How To Use WhatsApp in A Pop-up in Chrome Browser? Step 1: Open the link given at the end of this article. This will help you install this extension. Step 2: After the installation, the icon of this extension will appear on the top right side. Click on that icon and WhatsApp Web interface will be visible to you. Now you can scan the QR code using your mobile. That’s it! When WhatsApp is connected, you can see the list of chats. Clicking on a chat will open the conversation. The rest of the features like search a chat, mute a chat, etc., are same. Step 3: You can also open Options of this extension and then change height n width of pop-up and color for notification. I will suggest you keep the default height n weight because it looks good. Did you know you can also add contacts using WhatsApp Web? 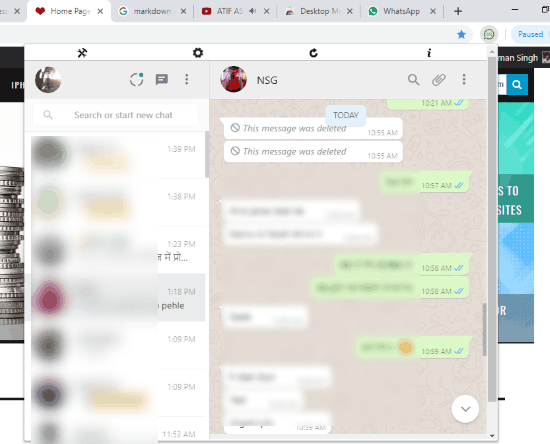 Using WhatsApp in a pop-up in Chrome browser is definitely convenient. Instead of leaving the active tab, you can continue with your work and open WhatsApp within the same tab with a click. The good thing is its badge icon will also show the number of unread notifications to keep an eye on new messages.